To this day, Sylvia Plath’s writings continue to inspire and provoke. Her only published novel, The Bell Jar, remains a classic of American literature, and The Colossus (1960), Ariel (1965), Crossing the Water (1971), Winter Trees (1971), and The Collected Poems (1981) have placed her among this century’s essential American poets. Sylvia Plath was born on October 27, 1932, the first child of Aurelia and Otto Plath. When Sylvia was eight years old, her father died — an event that would haunt her remaining years — and the family moved to the college town of Wellesley. By high school, Plath’s talents were firmly established; in fact, her first published poem had appeared when she was eight. In 1950, she entered Smith College, where she excelled academically and continued to write; and in 1951 she won Mademoiselle magazine’s fiction contest. Her experiences during the summer of 1953 — as a guest editor at Mademoiselle in New York City and in deepening depression back home — provided the basis for The Bell Jar. Near that summer’s end, Plath nearly succeeded in killing herself. After therapy and electroshock, however, she resumed her academic and literary endeavors. Plath graduated from Smith in 1955 and, as a Fulbright Scholar, entered Newnham College, in Cambridge, England, where she met the British poet, Ted Hughes. They were married a year later. After a two-year tenure on the Smith College faculty and a brief stint in Boston, Plath and Hughes returned to England, where their two children were born. Plath had been successful in placing poems in several prestigious magazines, but suffered repeated rejection in her attempts to place a first book. The Colossus appeared in England, however, in the fall of 1960, and the publisher, William Heinemann, also bought her first novel. By June 1962, she had begun the poems that eventually appeared in Ariel. Later that year, separated from Hughes, Plath immersed herself in caring for her children, completing The Bell Jar, and writing poems at a breathtaking pace. A few days before Christmas 1962, she moved with the children to a London flat. By the time The Bell Jar was published under the pseudonym Victoria Lucas, in early 1963, she was in desperate circumstances. Her marriage was over, she and her children were ill, and the winter was the coldest in a century. Early on the morning of February 11, Plath turned on the cooking gas and killed herself. 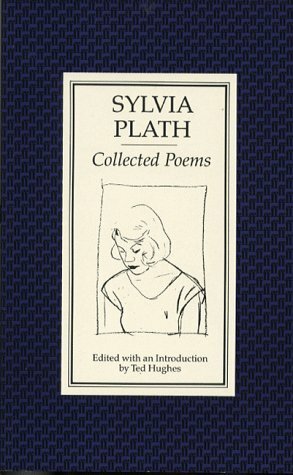 This volume contains all Sylvia Plath’s mature poetry written form 1956 up to her death in 1963. The text is preceded by an introduction by Ted Hughes and followed by notes and comments on individual poems. There is also an appendix containing fifty poems from Sylvia Plath’s juvenilia. Borzoi Reader – includes an excerpt from The Journals of Sylvia Plath and four audio clips. Unitarian Universalist Association – focuses on Plath’s religious life. HarperCollins – short publisher bio. The Academy of American Poets – includes links and a few poems. Sylvia Plath’s Ariel Poems – from the City Honors School. Sylvia Plath (1932-1963) – a collection of papers from the Online Journal and Multimedia Companion to Anthology of Modern American Poetry. Sylvia Plath Forum – links to audio clips of November Graveyard, Black Rook in Rainy Weather and other poems. swisseduc.ch – links to audio clips of Lady Lazarus, Daddy and other poems. A Wind of such Violence - collection of Sylvia Plath’s poems.